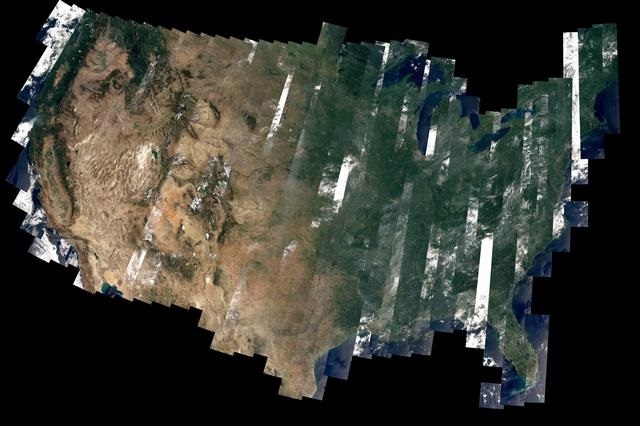 Early view of the United States from Landsat 8, from observations in August 2013 by the Operational Land Imager. Created by David Roy, a co-leader of the USGS-NASA Landsat science team and researcher at South Dakota State University. Image courtesy NASA/USGS. Sixty years ago on the 1st October 1958 the National Aeronautics and Space Administration, or NASA as most people refer to them, began operations. Ten days later they launched their first unmanned mission, Pioneer 1, and since then have sent over 200 manned and over 1 000 unmanned missions into space. Whilst, the moon landing is probably NASA’s most famous achievement, there have been many more since and for us it’s their work with Earth Observation (EO) which is of most interest. Starting with TIROS 1, the first weather satellite, launched in 1960; to the invaluable forty-six-year archive from the Landsat missions, through to the ICESat-2 mission which launched last week and many more in between. For anyone wanting to read more about NASA and its history, there is a fantastic 60 years resource on the NASA website. Whilst these are all fantastic achievements for those us who love space and the space industry, it’s worth remembering that the technologies developed by NASA have also made significant contributions to everyone’s lives on Earth. For over twenty years NASA has released a book each year, Spinoff, which describes how their technology has been transferred to other uses including everything from the mobile phone, swimsuits and even trainers; all have benefited from NASA’s innovations. Ariane 5 milestone 100th launch from Europe’s Spaceport in French Guiana on 25 September. Image courtesy of ESA. 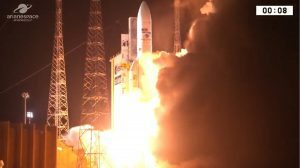 The second milestone of the week came last weekend when the Ariane 5 rocket completed its 100th mission by launching two satellites towards their planned orbits some 36 000 km above the Earth. 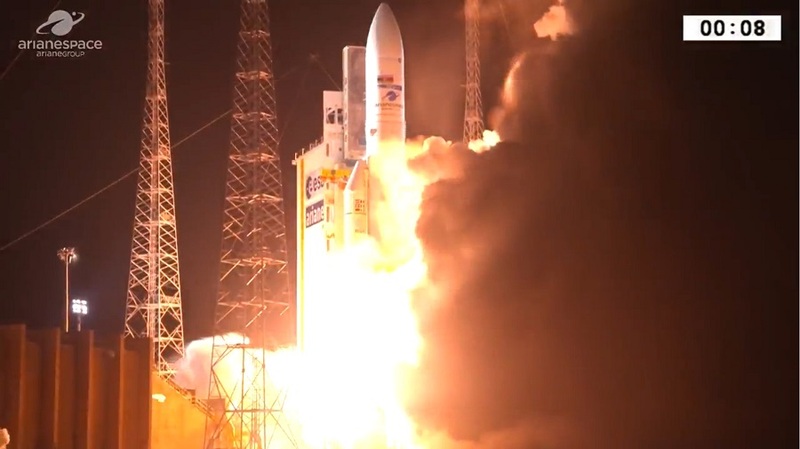 At 22:38 GMT on Tuesday 25th September, the Horizons-3e and Azerspace-2/Intelsat-38 satellites took off from Kourou, French Guiana, with the first satellite released just shy of half an hour later and the second following fourteen minutes after. In a twenty-year career to date, Ariane 5 has put over 200 payloads into space. It’s not been all plain sailing, it broke up just over half a minute into its maiden flight, and there was a further failure in 2003. Despite this, it has developed a successful career putting heavy satellites into orbit. It’s successor, Ariane-6 is due to be launched in 2020, although Ariane 5 won’t be going away just yet with planned missions including sending the BepiColombo probe on its way to Mercury next month and the follow-on to the Hubble telescope in 2021. As the demand grows for EO data, obviously the demand grows for the market putting all those satellites into space. Alongside Ariane, NASA, the Indian Space Research organisation, who launched a world record 104 satellites in one go in 2017, are the new space ventures such as Space X. In addition, it was announced earlier this week that the Chinese company, Landspace, will unveil its Zhuque-1 rocket towards the end of October. This will be the first Chinese private orbital launch vehicle and, at 19 m tall, it will offer the capability to deploy a 200 kg satellite into a 500 km orbit. This just shows that whilst the space industry isn’t new, we’ve been around for over half a century; there are also still real opportunities around for companies who want to get involved! This entry was posted in Data, Earth Observation, ESA, Landsat, NASA, Remote Sensing, Satellite, Space Can Help, Space Industry and tagged Ariane 5, Ariane 6, china, Earth Observation, ESA, French Guiana, ICESat-2, Indian Space Research, ISRO, Kourou, Landsat, Landspace, NASA, National Aeronautics and Space Administration, Pioneer 1, satellite, space innovation, space technology, Spinoff, TIROS 1, United States of America, Zhuque-1 by Andy. Bookmark the permalink.